Adventuresome couple and lots of fun. We decided to put Angela and Michael in front of the Freight elevators for this shot. We carefully placed an off-camera remote slaved flash behind them to light up the veil and also create drama. We used one on camera flash and then an umbrella mounted on the other side. This great posed was created by Toni, but carried out quite effectively by the couple! The happy couple liked this photo so much that they ordered a large size wall portrait for their home. its not truly a Silhouette image, but we use the same technique to accomplish it. We place a speed light behind the couple and control it with a Radio Slave. The light behind them not only lights up the veil, but it also bounces back to the wall behind them and provides a brighter background. This helps us create a silhouette look if so desired. 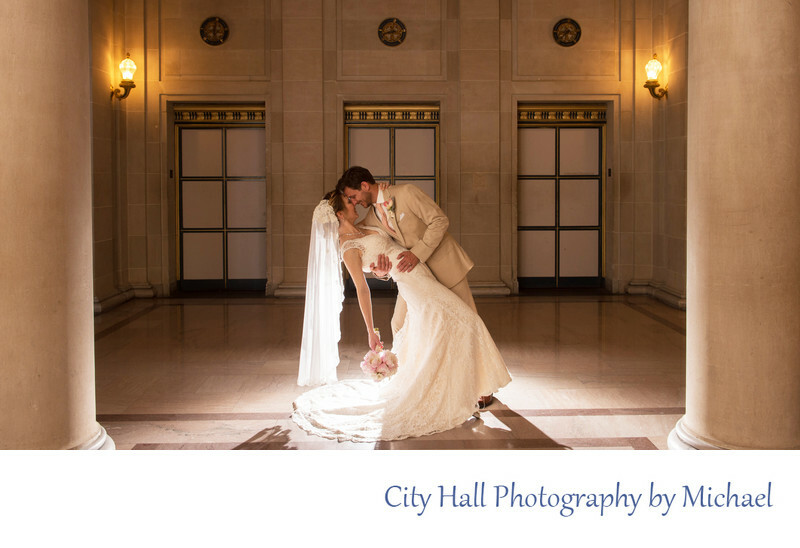 San Francisco City Hall has many locations that make the creation of this type of wedding image possible.